This is a very exciting time to be involved in world missions! Urbanization and globalization have opened doors to communicating the Gospel and sharing resources unlike any time in our history. While much of this change can be mind-boggling, it ultimately represents a strategic time to be fully engaged in world missions. Here at Second, our goals are to identify strategic fields and ministries and to partner with those involved in advancing the Gospel in those areas. We seek to call, train, and send missionaries to the field, as well as partner with national and international workers involved in that same endeavor. On Mission Sunday you will receive our prayer book, which this year is formatted this year to take us around the world in 90 days of prayer. 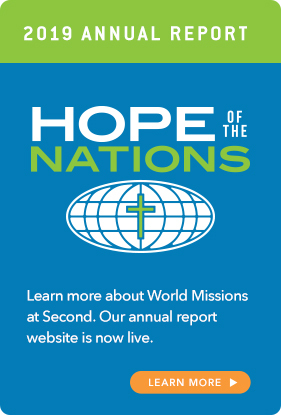 It lists our missionaries, with their background and their prayer requests for the year. We hope you will consider accepting this challenge and pledging to pray for your missionaries for the next 90, 180, or 360 days. You can register for online for missionary prayer requests at www.2pc.org/mailsettings. You can even get a daily or weekly prayer reminder sent straight to your cell phone. We would love for you to join our “Read-Pray-Delete” movement by promising to read about a missionary, pray for them, and then delete the message, leaving room for the next day’s prayer update. http://www.engage2025.org- offers information about Engage 2025, which seeks to plant Protestant Reformed churches in 10 unreached Muslim communities by 2025.